Posted in: Featured, News & Events, S.T.E.M. 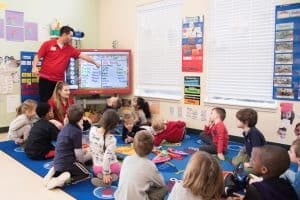 The activity was recently done at Kiddie Academy of Abingdon in Maryland. The teachers thought it would be fun to perform an observational experiment about items that sink or float. They asked students to bring in an item that was safe to put in water. 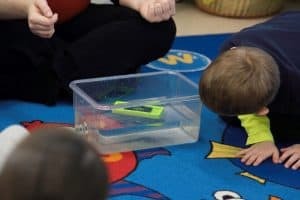 Before the experiment, they made a chart listing the items, then asked the children to come up with a hypothesis – an educated guess – about which items would float and which would sink. They tallied up the votes, then conducted the experiment. After the experiment, they revisited their chart to see how their hypotheses compared with the actual results. This experiment highlights observation, deductive reasoning, hypothesizing, and comparing and contrasting results. Here’s how you can perform the experiment at home. Step 1: Have your child gather different items that are safe to place in water. Step 2: Pour water into a clear bucket. A clear bucket makes it easier for children to see if an item sinks. Step 3: Create your hypotheses. 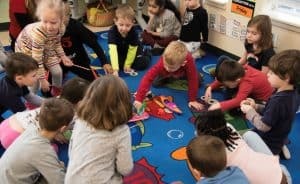 For each item, discuss whether you and your child think it will sink or float. Mark your guess for each on a list. Step 4: Have your child place each item, one at a time, in the bucket to identify if it sinks or floats. Talk about why you think each item floated or sank. Step 5: Revisit your list of hypotheses and compare it to the results of your experiment. Just a reminder that the first STEM Adventures events kick off Jan. 26 and 27 in many of our Academies. There are also events schedule on Feb. 23 and 24. CLICK HERE to find a participating Academy near you and register for STEM Adventures!